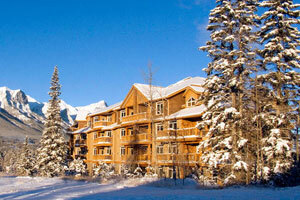 The Falcon Crest Lodge is one of Canmore's newest apartment hotels and is elegant and luxurious. Finishings include granite counters, marble throughout, and soft duvets. The Falcon Crest Lodge offers two outdoor hot tubs and an exercise room. This hotel is excellent value for money based on the luxury you will receive. Their largest 2-bedroom units are perfect for a family or friends getaway. The Falcon Crest Lodge is also a great base for weddings, social events and corporate retreats in Canmore with meeting rooms with mountain views that will accommodate up to 45 guests. Contact us for more information or to book this Canmore hotel. When you book the Falcon Crest Lodge in Canmore through us, you pay one room rate regardless of how many people are staying in the room. For example if you book a deluxe room, the room rate is the same whether 1 or 4 people stay in the room. Please note that there are maximum occupancy limits for each accommodation.